When is the Next Blue Moon? So Just What IS a Blue Moon? So... Just When IS the Next Blue Moon?? hen Is The Next "Blue Moon?" Here's an example: if you were living in the Americas, Europe, Africa, India or western Russia in 2004, you might have heard that there was a Blue Moon in July of that year. On the other hand, if you lived in Hong Kong, Japan, Australia or eastern Russia, you might have heard there was a Blue Moon in August 2004. Confused? Trying to define Blue Moon is confusing at the best of times, as I discovered while researching this article! The current popular definition of a Blue Moon is the second Full Moon in the same calendar month. But just figuring out when any Full Moon takes place can be tricky business. Time zones must be taken into account, which could change the day and even the month that it falls on. My Canadian calendar for 2004 says there was a Full Moon on July 31 at 2:04 PM, Eastern Daylight Time, but a calendar sold in Tokyo, for instance, would have shown that same Full Moon on August 1 at 3:04 AM. In 2004 there were also Full Moons on July 2 and August 29 (or August 30, in the far east time zones), so depending on where you live, the second Full Moon was either on July 31 or August 30. Still confused? You're not alone! Does this really mean the Blue Moon is different for different parts of the world? Well, yes and no. The deeper problem is that the popular definition of Blue Moon – the second Full Moon in a calendar month – is based on misinterpreted information that was published in a Sky and Telescope magazine article in 1946! Ironically, it was a 1999 article in the same magazine that discovered and corrected the mistake, but by that time the media, Internet, and even the Trivial Pursuit game, had proliferated the incorrect definition and now most of the world understands an incorrect, if persistent, definition of Blue Moon. There's an older traditional meaning of "Blue Moon" that goes back to the 19th century and means the third Full Moon in a season which has four Full Moons. So what, right? Well, each season consists of 3 months, typically with one Full Moon per month = 3 Full Moons per season. So, having four Full Moons in a 3-month season is something that happens, quite literally, only once in a Blue Moon. The Maine Farmers' Almanac (which was incorrectly referenced in the now-infamous 1946 article) reportedly marked this third of four Full Moons in blue ...in honour of an even older use of the term. What—another definition?? Yup. The earliest reference to anything about a Blue Moon comes from a rhyme going back to 1528: "If they say the Moon is blue, We must believe that it is true." 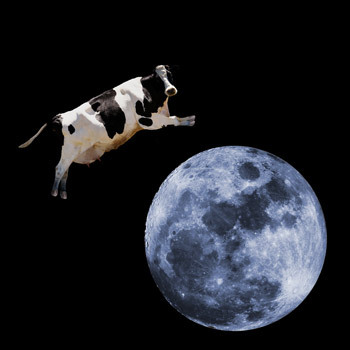 Saying the Moon was blue was like saying the Moon was made of green cheese—in other words, it was an unquestioned impossibility. The actual phrase "once in a blue Moon" apparently dates back to the mid-19th century. By this time it was reasonably well known that occasionally the Moon really did appear blue under certain atmospheric conditions, so the phrase took on the revised meaning of "once in a while," rather than "never" or "gimme a break!" But wait a second—how did we get from a silly cultural expression to the third Full Moon in a season of four being marked in the Maine Farmers' Almanac? And more to the point, why would anyone care how many Full Moons there are in a season? Before you start assuming that this is yet another Pagan influence lingering in modern culture, you should know that the main reason for identifying the seasonal Full Moons was to calculate Christian holidays. Easter is deemed to be the Sunday after the first Full Moon following the vernal (spring/March) equinox (called the Paschal or "Passover" Moon in the Jewish calendar—Jesus being Jewish and the timing of Easter being linked to Passover). Since many Christian holy days are timed in relation to Easter, it became extremely important to be able to determine an accurate date for it. Full Moons are given special names and meanings in many cultural traditions, as any good Pagan knows. (So yes, Virginia, there does seem to be a Pagan connection after all, albeit an indirect one.) Actually, many religious traditions and cultures have named the Full Moons. Each Full Moon is spaced 29.5 days apart, so there is typically one per month—12 months, 12 Moon names, 12 Full Moons. The problem comes when we occasionally get 13 Full Moons in the span of a year (which happens about every 2-3 years). With only 12 Moon designations, what to do with the 13th Moon? The Maine Farmers' Almanac claimed this caused the early Christian monks such distress when calculating their calendars that it is the reason why the number 13 became cursed as being unlucky. At some point this extra Moon became known as the Blue Moon, which was deemed to be the third Full Moon in a season that had an extra (fourth) Full Moon. But wait a minute—the third Full Moon? Why not the fourth, which would seem logical as the "extra" Moon in a season normally populated by three? For this we must go back to the Easter-related Christian holidays. The period of Lent, which begins precisely 46 days before Easter, must contain the Lenten Moon, which is considered to be the last Full Moon of the winter season, which ends at the vernal equinox. Ahhh, now we start to see the need to count the number of Moons per season! The last Moon of a season is sometimes special (e.g., Lenten Moon), and the first Moon is sometimes special (e.g., Paschal Moon). So, the "extra" position falls to the second or third Moon in a season that happens to contain four. Why the third is designated as the "extra" rather than the second remains a mystery—no one seems to know where the Maine Farmers' Almanac got their Blue Moon rule from. One website I found speculates that Full Moons were simply counted as the "first," "second" and "last" of a season, so that the extra Moon defaulted to the third. So: now all that's left to figure out is the beginning and end of the seasons, which is nice and straightforward—right? Seasons are defined by the solstices (times of maximum and minimum daylight, in June and December) and the equinoxes (times of equal day and night, in March and September). These are also the days when the Sun moves into the Cardinal signs: Aries and Libra (equinoxes) and Cancer and Capricorn (solstices). But anyone born near the cusp between two zodiac signs can tell you that the date when the Sun changes signs will vary slightly from year to year. The Sun actually reaches the vernal equinox position (when it moves into Aries) anywhere from the evening of March 19 to the early morning of March 22, depending on the year and which time zone you happen to be in. And then there's whether you calculate the equinox by the Sun's actual position or by averaging its position (like the Maine Almanac did), or just using a fixed date (like the Roman Catholic Church does). Just as time zones can complicate the date of Blue Moons rendered by the "monthly" method, your method of calculating the equinoxes and solstices can sometimes even change which season winds up saddled with the 13th Full Moon. You can start to sympathize with those poor Christian monks! And we won't even go into the Gregorian versus Julian calendar, resulting in different Easter dates between the Roman Catholic and Eastern Orthodox Churches! Suffice it to say that the Roman Catholic Church decided in 325 CE that the vernal equinox, for their purposes, was deemed to reside henceforth on March 21, rain or shine, regardless of what the Sun happened to be doing at the time. Amen. When there are two consecutive Moons in the same sign, the second Full Moon will always be in the last couple of degrees in the sign. This alone is significant, since the last degree of any sign is a critical degree. When any planet is 29 degrees "and change" it is in a process of transition from one sign to the next. It is neither officially in the next sign, nor fully present in the one it's leaving. This can be a frustrating energy, full of anticipation and yearning to get on with it in the new sign, yet held back by unfinished business and the need to do closure in the old sign. It's a bit like walking and being in mid-stride – you haven't landed on your stepping foot yet, and your pushing-off foot is still in mid-push. You're moving, but you're in a kind of suspended motion in between steps. By the same token, the first of two Full Moons in the same sign will always be in the earliest couple of degrees in that sign. This is also significant, since these early degrees are initiatory energy, especially the first degree of any sign. It's like a newborn babe – innocent and pure; full of potential and bellowing its arrival at the top of its lungs! So this double Moon phenomenon is like getting the alpha and omega of that sign's energy - the burst of new energy and the closure of that energy. To gain insight into some of the differences between the two Full Moons or New Moons, check out the two charts. The charts will often reveal some of the key differences in how you might experience this alpha and omega effect. For example, the Moon will be making different aspects to other planets in each chart. You could also look to the planetary ruler of the sign involved to see what differences there are in its aspects and placement. Some astrologers feel that two Full Moons in the same calendar month (i.e. the popular definition of Blue Moon) make that month extra intense. My sense is that this might be more about the person's personal experience, rather than the phenomenon itself. Remember, this was originally something that was created to fit an extra Full Moon into the Christian calendar, not an ancient rite. Any direct astrological correlation there might have been with the calendar months would have been lost long, long ago, since the western calendar has been revised and adjusted many times over the centuries. By the current popular definition (two Full Moons in a month) a Blue Moon happens about every 2½ years, and by the older definition (third Moon in a season of four) it is about the same frequency. However, each definition yields totally different dates and even different years. For in-depth information about the Full Moons and New Moons, check out my articles in The Low-Down on the Far-Out. In the meantime, here is a table with the dates of these various blu-ish Moons between 2000 and 2020. Watch for any special effects of these Moons and judge for yourself how they might be interpreted. Note: All times in the table above are in Universal Time. To convert the date and time to your time zone, add or subtract the number of hours you are from Greenwich. For example: for Eastern Time in North America, subtract 5 hours for Standard Time or 4 hours for Daylight Time. For Australian Eastern Time, add 10 hours for Standard Time or 11 hours for Daylight Time. And so on. If you're not sure, check out the time zone of your location at TimeAndDate.com. © 2004, 2012, Wendy Guy. All rights reserved. Based on an article by the author originally published in the Summer 2004 issue of Cauldron and Quill Magazine. 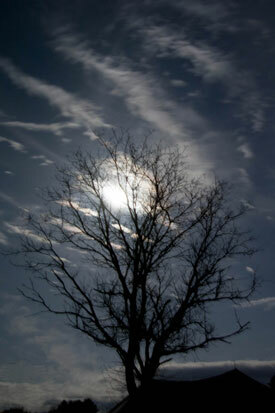 Photo of Full Moon behind tree by Paul Anderson via MorgueFile.com.